Kimberlee Frank is known as “The Real Estate Junkie” is a Foreclosure Short Sale Expert who is regularly sought out by the media. She has been featured on ABC, NBC, FOX, CBS as well as Wall Street Journal, Newsletter, USA Today and numerous other publications. She is the best selling author of “Big Ideas for Your Business” (Advantage Media 2009). She is also 1 of Americas Premier’s Experts. 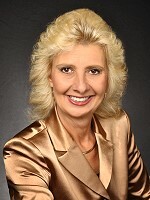 Kimberlee Frank has been a successful real estate investor since 1998. By successful I mean she has bought and sold hundreds of homes all with “no money down.” She is also a real estate broker, author, mentor, and teacher. Her success began in Fenton, Michigan where she specialized in purchasing, renovating, retailing and lease optioning single-family homes. In her first 6 years of business, she bought and sold 60 properties – profiting over one million ($1,000,000) dollars. Before becoming a full time investor, she was a legal secretary for 18 years for various attorneys, real estate brokers, and builders. She has crossed the “t’s” and dotted the “i’s” on hundreds of real estate deals and thousands of documents which qualifies her as an expert in real estate documentation as well. She has created many different courses which teach you how to set yourself up in the business from Corporations, Book keeping, Land Trusts, Buy and Sell, Lease Options, Short Sales and Subject To. Her newest program, which teaches the serious real estate investor who wants to become a local real estate guru, is called “Apprenticeship Business System” and is a unique niche that no one is teaching. This program has been very well received in the real estate community. In fact, Ron LeGrand likes it so much, he scheduled her for his Customer Appreciation Event in he which teaches other investors multiple streams of income. Kimberlee is a true “transaction engineer”. Several years ago, she was offered the first Female Mentor Position with Russ Whitney’s Building Wealth. Kimberlee and her husband, Larry’s story are in Ron LeGrand’s “How to Be a Quick Turn Real Estate Millionaire Book”, page 101. She has shared the stage with Jeff Kaller and Ron LeGrand. She was in the newspaper and on the television for giving away a FREE MERCEDES with the purchase of a home which shows that she is very creative in selling houses fast. In 2003 the real estate market changed, foreclosures were on the rise and she started investing in foreclosures and became a short sale specialist. In 2006, her family moved to Orlando, Florida. From there, things just skyrocketed. That’s how, in just one year, my partners and I took control of $22 million dollars worth of property using the Apprenticeship Business System.